Most dentists don’t have the marketing budget available to corporate dental practices. As a result, it’s important to stretch a dollar so you can attract the most patients with limited expenditure. Thankfully, digital marketing services for dentists take many different forms. By finding the best combination of strategies to fit your budget and reach your ideal patients, you can maximize your marketing ROI and build quality leads for your practice. In order to do more of the procedures that you enjoy and generate profit for your practice, you need to know what your prospective patients need. Page 1 Solutions works with many general dentists who want more cosmetic cases, and we also help specialists capture more patients within their niche. Knowing the demographics of your patients affects all aspects of your marketing, including the imagery and content on your website, your advertising strategies and much more. It’s also important to think about your competitors in the community. If you have a family dental practice in a major city, you likely face significant competition for patients. You welcome patients throughout the city, but focusing on specific “name” parts of the city will result in more revenue. Conversely, if you are one of the few or even the only orthodontist, pediatric dentist, periodontist, prosthodontist or other specialist in your city or even the whole state, you stand a better chance when marketing to a large geographic area. Many types of digital ads, from display advertising to the native ad platforms on multiple social media networks, not only have the ability to target select demographics and geographic areas but also psychographic qualities. These are the traits that define your patients’ thoughts, beliefs and behavior. The messaging and parameters of your campaigns will be very different for patients who are youthful and health-conscious than those who are retirees. From solo Web developers to professional marketing agencies, the options for designing a dental website are dizzying. There are many different factors to take into account when building a website for your practice, but don’t let price be your sole deciding factor. Odds are good that more prospective patients find you on their phone or tablet than they do on desktop computers. Your website needs to be more than just responsive or “mobile-friendly”; put yourself in the shoes of a mobile user first, and make sure your website is functional and looks good on multiple devices. See how your website fares on Google PageSpeed Insights. This free tool provides digestible information about how quickly your website loads and identifies issues that slow it down. If your site scores Medium or lower, it’s time to make some changes. Dental care and your community changes, and your website needs to be just as nimble. A CMS gives you and your team the ability to make updates to your website. Announce new specials, add bios for new team members, write blog posts — all of these keep your practice fresh in the eyes of visitors and search engines. The use of HTTPS on your website is no longer an option — it’s a necessity. Users expect their information to be secure, especially when communicating with a medical practice. Furthermore, browsers are beginning to inform users when connections on a website are not secure. Investing in HTTPS signals to users that you take their security seriously, which builds trust. Keyword research used to mean pairing valuable service areas with your location. By spamming mentions of those terms across a website, you improved your likelihood of ranking. Those days are gone, and for good reason. Your patients don’t search in this rote, predictable manner, and your SEO strategy needs to evolve in kind. Nowadays, we perform keyword research by understanding the general topics users search (these usually encompass your practice areas) and assessing the myriad of ways your patients find information on those services. Think about the shape of the sales funnel. A lot of visitors enter the funnel with preliminary needs and questions. After educating themselves, these patients become aware of their options and start applying what they know specifically to their situation. Finally, the patient is looking for the best dentist for their needs. These last patients are the ones you and your competitors want to convert into leads and cases. By optimizing your website to appeal to different sections of the sales funnel, your practice will stand out from the competition and drive more leads. Pay-per-click advertising strategies have also evolved due to the growing competition in paid search. You might get leads from PPC campaigns, but highly competitive keywords quickly devour your budget. A better strategy is pursuing less-competitive but nonetheless desirable keywords that drive leads while securing a better ROI than campaigns that focus exclusively on the “white whale” search terms. The easy answer is be creative, but the best answer is be human. Show patients you understand them with high-quality content! Remember the keyword research section? Extrapolate from those words and phrases to determine what makes your potential patients ask specific questions about your services. And, when you answer them, make your responses relatable. You are justifiably proud of finishing dental school, completing post-graduate training and keeping up with continuing education. But you wouldn’t launch into a clinical explanation when describing your day to a friend or family member, and the content on your website should be accessible, too. The best dental content centers on accurate and informative details. Next, you need to tell visitors why you and your team are standout providers of this treatment (but DON’T hard-sell). Finally, provide visitors with a means to contact your office without commanding that they get in touch. Custom video content in which you address FAQS, tell patients about you and your practice and show users who you are with an office tour, scenes from community activities, etc. Google is the world’s leading search engine. Users turn to Google not only for information about your services, but also to find a dentist in the local community. It’s also important to ensure that prospective patients find you on leading directory and reviews websites, from Yelp to Healthgrades. Users might see you in a Google SERP first, but they learn more about you on sites that enable them to compare you to the competition. No matter the platform, make sure the information about you and your practice is up to date and consistent. You don’t want to confuse potential patients by listing conflicting hours or the wrong phone number. Google My Business and many directory websites don’t just display information. They also include reviews from actual patients. If you have a limited number of reviews, outdated reviews or a collection of average to bad reviews, your online reputation is at risk. Some dentists choose to manage online reviews on their own or with the help of staff members. Once a negative review gets posted, however, it can be difficult to undo the damage. A robust online reviews and ratings platform can alert you to negative comments before they are published online. They also give dentists the ability to amplify positive reviews through social media and automate reminder emails to encourage patients to share their experience. Reviews build trust. If users see that a lot of patients have reviewed you online and provided honest accounts of their experience, they are more likely to choose you over your competitors. But consistency is key: A reviews platform should be easy to implement so you can cultivate positive reviews, control what gets published and post testimonials on the site that bring you patients. Users on social media don’t just connect with their friends. More and more, they want to forge a personal connection with businesses and service providers. Patients also turn to social media when they want to read reviews for local dentists. Thus, Facebook and other platforms are another opportunity to manage your online reputation and put your best foot forward to visitors who find you outside of search results. Patients won’t always convert the first time they visit your website. However, this doesn’t mean that you can’t maintain their attention. By embedding strategic call-to-action graphics on your priority practice area pages and linking them to dedicated download pages, you can build a database of potential leads and execute an inbound marketing campaign. Potential patients who submit their contact information in exchange for a free download will be added to a targeted email automation campaign. These campaigns inform prospective patients and build rapport with them while they make decisions about dental treatment. Rather than arriving in the inbox all at once, these emails are staggered in order to hold the prospect’s attention without overwhelming them. Inbound marketing campaigns allow you to play the long game. You might not get leads on the first visit, but you give visitors the chance to get to know your practice and see how well you meet their needs, thus supplementing your lead totals over time. You can also stay on potential patients’ radar by tapping into their Internet browsing behaviors. Display and pre-roll video advertising leverages the popularity of select website to show users ads for your practice as they surf the Web. Display advertisements appear on websites that belong to an ad network. This results in repeat — nearly inescapable — exposure, which keeps your practice top of mind. Pre-roll ads play before the start of videos on popular platforms like YouTube. With this cost-effective strategy, you only pay if the user watches the entire video. And, because user engagement is much higher with video than other forms of content, there is a greater likelihood of converting a user who sees your ad into a patient. How will you know if your digital marketing efforts are successful if you don’t know how new patients are finding you? Google Analytics provides extremely detailed data on the Web pages users visit and what they do, not to mention how they got to your site in the first place. With so many sources for potential conversions, online lead tracking is essential. It allows you to review trends month over month and year over year, and identify strengths and weaknesses in conversion elements of your site. And, perhaps most important at all, it is a strong indicator of your marketing ROI. If a significant number of your online leads turn into cases, the effect on your bottom line should be positive. As the saying goes, “You can lead a horse to water, but you can’t make him drink.” But, with the right training, your team members can take the phone and online leads generated by your digital marketing and consistently convert them into patients. Lead intake training is a supplement to your Internet marketing efforts. It teaches the members of your staff to ask the right questions, gather the most important information and guide patients to the treatments that generate revenue for your practice. The most successful dentists benefit from a seamless experience that begins with the practice website and off-site exposure, continues when prospective patients make contact and culminates when the patient arrives at your office. 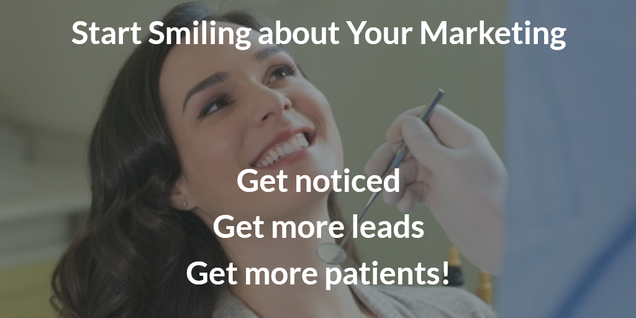 With a comprehensive digital marketing plan customized to your dental practice, you too can take full advantages of the many strategies available to capture leads and increase revenue. Why Doesn&apos;t My Legal Website Generate New Clients?